Roofing Superstore is proud to introduce the latest range of premium clay roof tiles from Dreadnought. 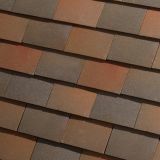 Dreadnought are a market leader in premium clay tiles, and have over 200 years experience in manufacturing clay roof tiles in the UK, and use a locally sourced Etruria Marl clay to create roof tiles with unrivalled strength and durability. This range of Dreadnought roof tiles is known as the Collingwood Blend of plain clay roof tiles. The collingwood blend range comes with a smoothface finish, creating a rustic and elegant looking roof of enduring quality. The Collingwood Blend can be supplied on pallets in a predetermined mix with the right proportions of quantities and colours. When the tiles are pre-mixed, valuable time is saved on site and additional savings are made as waste is reduced when laying. If you'd like to know more or have any questions about the Collingwood Blend range of plain clay roof tiles, feel free to call us on 01752 692760 or use the live chat in the bottom right hand corner.